Come, O Lord, to the help of your people, sustained by the intercession of Pope Saint Sylvester, so that, running the course of this present life under your guidance we may happily attain life without end. Through our Lord Jesus Christ, your Son, who lives and reigns with you in the unity of the Holy Spirit, one God, for ever and ever. Today is the seventh day in the octave of Christmas. 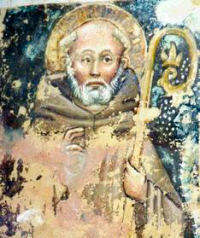 The Church celebrates the optional memorial of St. Sylvester I, pope and confessor. He ruled the Church during the reign of Constantine when the Arian heresy and the Donatist schism had provoked great discord. He convoked the first Ecumenical Council of Nicaea. The last day of the year is also the feast of St. Sylvester — bishop of Rome in 314. Constantine gave him the Lateran Palace, which became the cathedral church of Rome. Many legends exist about Sylvester. He supposedly cured Constantine from leprosy and later baptized him on his deathbed. New Year's Eve, along with its innocent gaiety, is really a day for serious reflection. On the eve of the civil New Year the children may join their parents in a holy hour, in prayer and thanksgiving for the gifts and benefits which God has given them in the past year, and to pray for necessary graces in the forthcoming civil year. St. Sylvester, a native Roman, was chosen by God to govern His holy Church during the first years of Her temporal prosperity and triumph over Her persecuting enemies. Pope Melchiades died in January, 314. 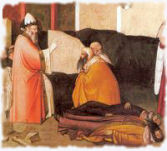 St. Sylvester was chosen as his successor. He governed the Church for more than twenty-one years, ably organizing the discipline of the Roman Church, and taking part in the negotiations concerning Arianism and the Council of Nicaea. He also sent Legates to the first Ecumenical Council. During his Pontificate were built the great churches founded at Rome by Constantine — the Basilica and baptistery of the Lateran, the Basilica of the Sessorian palace (Santa Croce), the Church of St. Peter in the Vatican, and several cemeterial churches over the graves of martyrs. No doubt St. Sylvester helped towards the construction of these churches. He was a friend of Emperor Constantine, confirmed the first General Council of Nicaea (325), and gave the Church a new discipline for the new era of peace. He might be called the first "peace Pope" after centuries of bloody persecution. He also established the Roman school of singing. On the Via Salaria he built a cemeterial church over the Catacomb of St. Priscilla, and it was in this church that he was buried when he died on December 31, 335. Numerous legends dramatize his life and work, e.g., how he freed Constantine from leprosy by baptism; how he killed a ferocious dragon that was contaminating the air with his poisonous breath. Such legends were meant to portray the effects of baptism and Christianity's triumph over idolatry. For a long time the feast of St. Sylvester was a holyday of obligation. The Divine Office notes: He called the weekdays feria, because for the Christian every day is a "free day" (the term is still in use; thus Monday is feria secunda).